(LEHUA ISLAND) – “100% success,” is how a researcher with Island Conservation describes this week’s non-lethal bait experiment on this small island, 17 miles west of Kauai, just off the northern tip of Niihau. State, federal, and non-profit partners conducted helicopter application of bait that is non-toxic, which they hope will ultimately lead to the use of rodent bait to eliminate Lehua’s rat population. Invasive rats are the primary predator of three federally-listed and/or endangered and threatened candidate seabird species that could establish breeding colonies on Lehua. Newell’s shearwaters, Hawaiian petrel, and the Band-rumped storm petrel may have been nesting there prior to the introduction of rats and rabbits. Rabbits have been eradicated from the island. The results of this week’s aerial application will provide guidance for the potential development of a project to use a rodenticide to control Lehua’s invasive rat population. The project would be at least one year out. 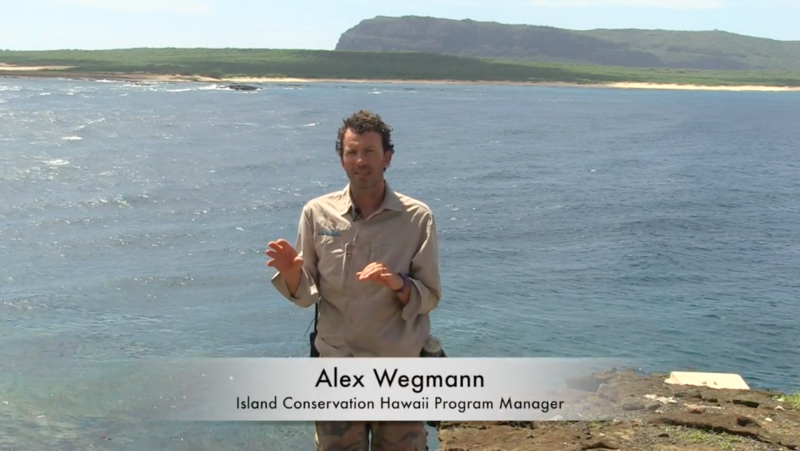 In addition to DLNR and Island Conservation other project and funding partners include; the U.S. Fish and Wildlife Service, the National Tropical Botanical Gardens, the National Fish and Wildlife Foundation, Bell Laboratories, and the David and Lucile Packard Foundation.